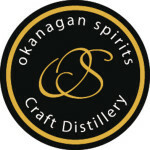 Okanagan Spirits is Western Canada's original craft distillery spanning over a decade in the production of award-winning B.C. spirits. Internationally acclaimed as North America's only designated World Class Distillery (World Spirits Awards), their portfolio includes a range of spirits from Whisky such as Rye, BRBN (Bourbon-style), Hopped and the exclusive Laird of Fintry Single Malt Whisky to Vodkas, Gins, Liqueurs, Brandies (Eaux de Vie) as well as Canada's first genuine Absinthe.